A teenager has appeared in court charged with stabbing a man to death outside Parsons Green Tube station. 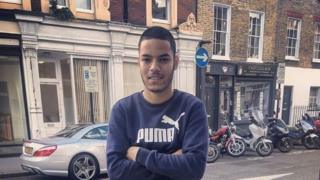 Omid Saidy, 20, died outside the London station on Monday. The 16-year-old boy, from Shildon, County Durham, appeared before Wimbledon Youth Court and cannot be identified for legal reasons. He is also charged with threatening another man with a knife. He was remanded and will appear at the Old Bailey in October. An 18-year-old man has been arrested in Mitcham on suspicion of murder, the Met said. Two females and a male were also arrested at the same address on suspicion of assisting an offender. All four are in custody. Mr Saidy, from Fulham, was pronounced dead in Parsons Green Lane at 20:30 BST on Monday. An 18-year-old friend of the victim was also stabbed in the attack and remains in hospital with serious injuries. He has been arrested on suspicion of affray. A second suspect, described as a black male dressed in dark clothing, fled down Harbledown Road in the direction of Fulham Court.